TEHRAN, Sept. 26 (Mehr News Agency) -- A team of Iranian archaeologists and some experts from Mainz University in Germany have recently begun the fourth season of excavations at the ancient site of Haft-Tappeh in Khuzestan Province. The team is scheduled to conduct a number of geophysical studies and also to continue excavations started during previous seasons, Iranian team director Behzad Mofidi told the Persian service of CHN on Thursday. The team's previous excavations in 2005 uncovered the ruins of an administrative building, the most important discovery so far at the Elamite site, he said. Many cuneiform tablets were unearthed from the building, which is believed to have been used as a documents center, he added. The tablets bear information on government properties including horses, carts, and precious objects. The archaeologists were also able to recognize the room used by the authors of the inscriptions, Mofidi explained. Expert on ancient languages Professor Doris Prechel of Mainz University in Germany is also slated to join the team during the current season of excavations. The ruins of the ancient city of Haft-Tappeh lie on the plain of Khuzestan close to the ruins of ancient Susa and two kilometers from the Chogha Zanbil Ziggurat. This large Elamite site contains fourteen major visible mounds, the largest rising about 17 meters above the surrounding plain, and its related extensions covering an area of about 1500 meters long and 800 meters wide. The ancient name of the site is still being debated. Some scholars have suggested that it may have been called Tikni, described in early documents as a religious center located between Susa and Chogha Zanbil, but no evidence has yet been found in the Haft-Tappeh excavations to support this theory. 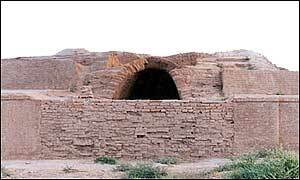 However, several seal impressions and clay inscriptions found at Haft-Tappeh contain the name Kabnak, and it is possible that this was the original name of the city. In 2005, the joint team was also tasked to search for the exact location of Kabnak, where the Elamite king Tepti-ahar built a temple complex in the fifteenth century BC and was buried at the site. However, they have yet to publish a report about their search. Tepti-ahar, the last ruler of the Kidinuid period (1460-1400 BC), known from inscriptions on bricks, a sale contract from Susa and a text said to be from Malamir (in Lorestan Province), is mentioned on approximately 55 of the Haft-Tappeh tablets, bearing the title "king of Susa and Anshan".